Have you considered locking in a Rutis vacation package? It's easy with Expedia, and you'll be able to buy a few nice meals or presents for your friends back home with the cash you save. Savings of up to C$590* are waiting for smart travelers who book a package deal on Expedia. With more than 400 airline partners and 321,000 properties worldwide, our extensive database can get you to where you want to be. Don't worry about postponing your group's vacation plans, as we don't charge additional cancellation fees for almost all of our reservations. Getting fired up about your trip to Rutis? After a few pointers about what to do and see when you get there? That's where we come in! It doesn't matter whether you're trying to hit a hole-in-one or just in the mood to brush up on your technique, you're sure to have a blast at Real Club de Golf de La Coruna. There's an excellent range of things to do in and around this destination. Slip on your helmet, chase the fastest lap time and feed your inner speed demon at Karting Marineda. Still have some time on your hands? Marineda City is the place to be if you're after some window-shopping. With crowds of people coming and going, there'll be plenty of fellow shopaholics to keep you company! Although you can find a fair amount of accommodations in Rutis, it doesn't hurt to have a plan. Cheap vacations and luxury getaways are merely the beginning at Expedia. We suggest the Hotel Attica 21 Coruña (C/ Enrique Mariñas, 34) and the Rialta Apartahotel (A Zapateira Rua de Laxe, 122-124). Look into the services and amenities and then decide. Have a snack, listen to some tunes and check out the in-flight movies. In no time you'll be shuffling out of the plane at Lavacolla Airport (SCQ)! Located 30 miles (48 km) south of Rutis, is this destination's nearest terminal. 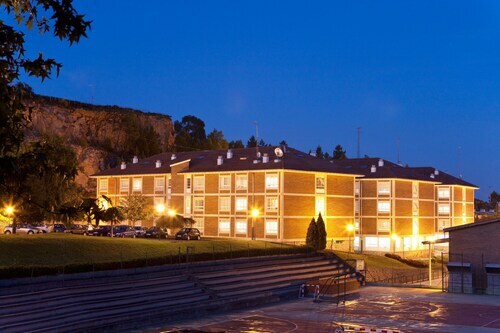 Situated in Culleredo, this hotel is 1.8 mi (2.9 km) from Coliseum da Coruna and 2.6 mi (4.1 km) from Marineda City. Real Club de Golf de La Coruna and Paseo da ría do Burgo are also within 3 mi (5 km). 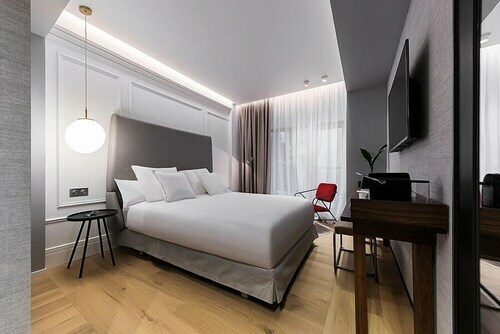 Located in La Coruna, this beachfront hotel is in the city center and within 3 mi (5 km) of Church of Santiago, Coliseum da Coruna, and Marineda City. Jardin de San Carlos and Emilia Pardo Bazan House Museum are also within 5 minutes. Situated near the beach, this hotel is 0.1 mi (0.1 km) from La Coruna Promenade and within 3 mi (5 km) of Coliseum da Coruna and Marineda City. Picasso House Museum and Orzan Beach are also within 5 minutes. La Coruna Station is 26 minutes by foot. 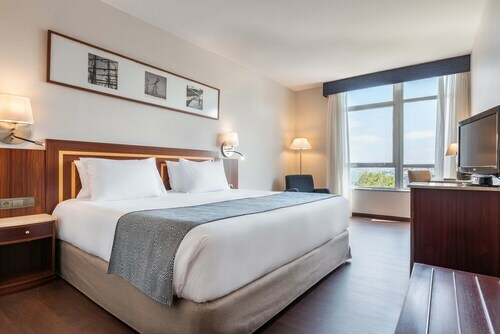 Situated near the boardwalk, this hotel is 0.1 mi (0.1 km) from Palexco Congress Centre and within 3 mi (5 km) of Coliseum da Coruna and Marineda City. Colon Theatre and Daniel Carballo are also within 5 minutes. La Coruna Station is 26 minutes by foot and A Coruña Station is 29 minutes. 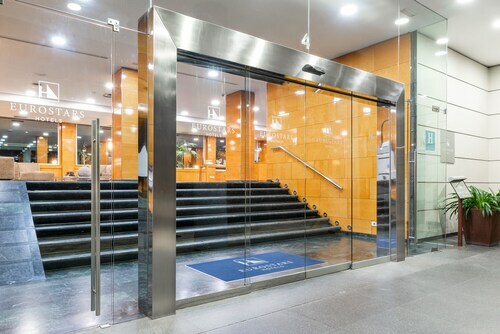 Located in the heart of La Coruna, this hotel is 0.1 mi (0.2 km) from Plaza de Lugo and within 3 mi (5 km) of Coliseum da Coruna and Marineda City. Picasso House Museum and La Coruna Promenade are also within 5 minutes. La Coruna Station is 19 minutes by foot and A Coruña Station is 23 minutes. Situated near the airport, this hotel is within a 5-minute walk of Karting Marineda and Marineda City. Coliseum da Coruna is 1.7 mi (2.7 km) away. A Coruña Station is 26 minutes by foot. 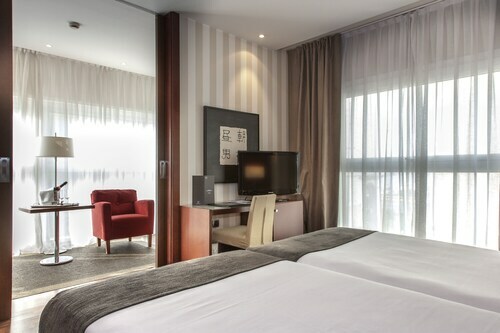 Located in the heart of La Coruna, this hotel is 0.1 mi (0.1 km) from La Coruna Promenade and within 3 mi (5 km) of Coliseum da Coruna and Marineda City. Riazor Beach and Orzan Beach are also within 5 minutes. La Coruna Station is 26 minutes by foot and A Coruña Station is 29 minutes. 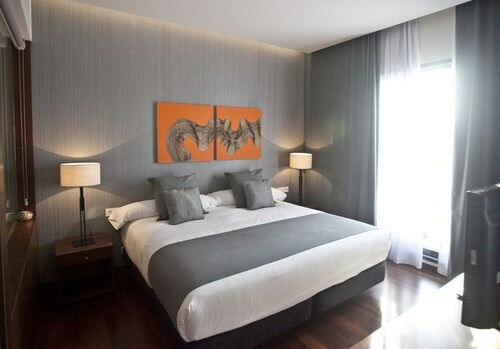 Situated in the historical district, this hotel is steps from La Coruna Promenade, Monument to the Fallen, and Menhirs. San Amaro Beach and Monty4 are also within 1 mi (2 km). Sun., 9 Jun. - Wed., 10 Jul.